There are two methods of auto shipping from which you can choose: Open Car Transport and Enclosed Car Transport. If you are shipping an exotic vehicle, it is best to transport it in an enclosed trailer. The trailer’s walls will ensure the best protection. But if you are looking for regular car transport and want to save money on it, you should go with Open Auto Shipping. Most shipping clients prefer this method as it is safe, convenient, and less expensive than Enclosed Auto Transport. It’s the best way to move a car a long distance. At Omaha Car Transport we provide all possible options for your auto shipping. If you are looking for a cheaper solution, our Omaha Open Auto Shipping will be a perfect choice for you. It is safe and reliable, and open car carriers are usually more available because this method of shipping is more typical. 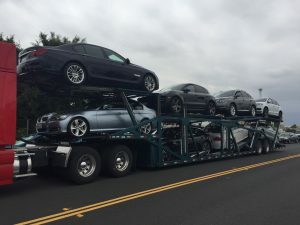 If you choose Omaha Open Car Transport, we will ship your car in an open trailer after properly securing it. It will be delivered under normal driving conditions, meaning it will be exposed to weather and road dirt. But that is all there is to be worried about. Your car might get delivered looking somewhat dusty, but it will arrive in great condition. Still, if you are looking for the highest level of safety for your Omaha Auto Shipping, your best option is Enclosed Auto Transport. Our company provides both, so with Omaha Car Transport, you can choose what works best for you. Contact Omaha Car Transport today for more info and a free quote. We offer some of the best rates in the country and have special discounts. Ship your vehicle safely at the best price!